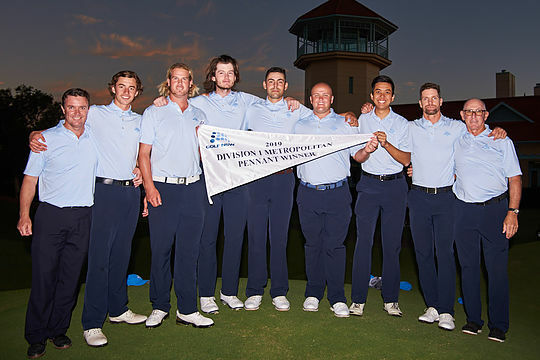 NSW Golf Club has secured back-to-back Division 1 Sydney Metropolitan Major Pennant flags with a thrilling defence of their title against Avondale at Terrey Hills Golf and Country Club. In one of the most closely fought finals in years, it was a superb approach shot and clutch birdie at the first extra sudden death play-off hole to NSW number two player, Zinyo Garcia, that sealed the deal for NSW. Garcia had been in a head-to-head battle with Chris Fan after Fan nailed a life saving putt on the 18th to finish their match all square to force extra holes after the teams had three matches each in. In front of an impressive gallery of supporters, the pair drove their tee shots into trouble, forcing both to layup on the reachable par 5 opening hole at Terry Hills. Fan was away first and hit his approach left of the pin to 8 metres, but on the right tier. Garcia then produced arguably the shot of the finals with a crisp wedge to within 2 meters. After Fan missed the putt, Garcia calmly rolled the winning putt to claim the flag. It was a climatic finish to a final that was littered with three putts and missed fairways. Obviously the pressure of a finals situation weighed heavily on the teams, the level of golf was not pretty, but it was effective. By the halfway point, NSW had moved to a commanding position with six matches in their balance. The Avondale team mounted a spirited comeback. As always in Pennant matches it’s the lower order who gains the advantage for the team. Henry Hesketh at number six for Avondale secured a vital match for his team with a 1-up win over Andy Li. Avondale’s number seven, Bryce Pickin was doing extra time in his match against Jake Reay and went all the way to the 21st hole to balance the final two matches each after Shaun Cameron at number five for NSW accounted for Anthony Robson, 1-up, and Dean Van Kampen at number four for NSW defeated John Smoljko, 2&1. William Bayliss at number three for Avondale accounted for Jake Baker, 3&1, to reignite Avondale’s chances, but Zac Mullins accounted for Jye Pickin, 3&1, in the top order match to turn the focus of the final on the the Garcia and Fan contest. This was Avondale’s first Division 1 Pennant Final appearance and they certainly put on a solid fight against a seasoned NSW outfit. Ultimately the title came down to one superb approach shot at time when it was needed. Garcia produced the goods in the heat of the moment as light was quickly fading causing some anxious moments for officials as to how the two teams would break the deadlock to get a result. The NSW outfit were ecstatic and rightly so, back-to-back wins is something to behold.